We love the humble onion, here are two large, thinly sliced red onions, but white are also good, slowly cooking and caramelising in a solid frying pan. Slice your onions thinly, and turn them over in a bowl before cooking with a scant tablespoon of oil and a pinch of salt. If you don’t like the smell of frying onions in your kitchen (one of the most savoury odours known to man, almost as good as softening garlic….) you can roast the shredded onions in a hot oven, spread out on a good solid tin. Even better, if you have one, is to line the tin with a sheet of that reusable silicon bake-o-glide or similar. Give them a turn every ten minutes or so until they reach your preferred state of sweet and cooked – the longer you go the browner they will turn. Delicious alongside liver, sausages or steak, they are also great with roast squash, crumbly cheeses and stirred into pasta. Onions grow well in Norfolk and Suffolk, and these pictured are from Frederick Hiam Ltd, based near Brandon, who specialise in onions and root crops. Onions must be lifted when fully ripe, normally in September, before the nights get cool and damp: the skins need to dry properly. Onions need careful controlled storage to be useable and marketable right through the winter to the beginning of the next season. 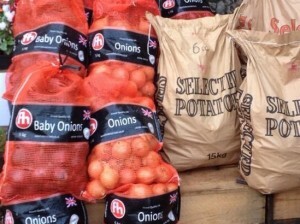 Which is why all shops have difficulty with the supply of good UK onions when spring comes…. We shouldn’t talk about long-ago liver horrors, that strong tasting, tough challenge for a sensitive child’s taste buds, dreaded at school dinners where weird tubes and ‘bits’ would lurk. 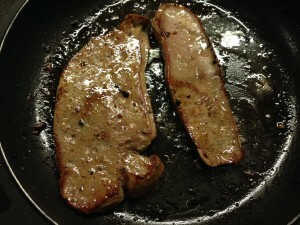 Instead, let’s welcome a lovely economical treat, a slice of tender, mild and delicious modern lamb’s liver. Rich, savoury, a source of iron and vitamin A, 100g per person should be enough. Critical to success is not to overcook – two minutes each side in a medium hot pan should be enough if the liver slices are thinnish. 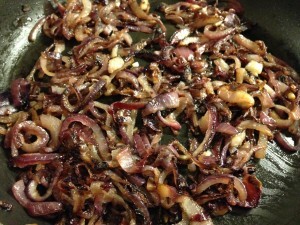 These were cooked in the same cast iron frying pan as the fried onions, which were taken out to keep warm, before melting a small knob of butter, then adding the seasoned liver slices. The liver is done through completely when there is no ‘give’ in it with a light prod – and is good tender eating when still a tiny bit of give is left, when the liver will have a touch of pink in the middle (worth tasting like this if you haven’t before, like a medium steak). You can remove the liver to keep warm with the onions, and deglaze your frying pan with half a glass of red or white wine if you have it, or use a couple of tablespoons of fruit vinegars, such as the ones we have in the shops from Scrubby Oak. Reduce well and dribble over your dish. Or just eat with a dab of mustard. Savoy is the one with the beautiful crinkly leaves. The creases and crinkles form excellent traps for flavours, and for gravy, so if you are holding back on the carbs in anticipation of feasts to come, a pile of shredded savoy cabbage on your plate will do a great deal to cheer. Heat a tablespoon of olive oil, add a squashed clove of garlic, let it cook for just a minute (do not brown), add your cabbage shredded as finely as you can, salt and pepper and a sprinkle of chilli flakes. 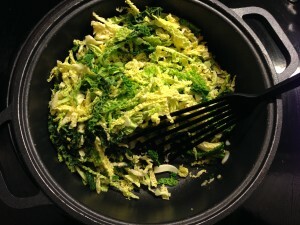 Half the average cabbage serves 2, use the whole thing for four. Turn over in the pan for a minute or two, add a splash of water or of stock if you have it, cover with a lid and cook on a low heat for 10-15 minutes or until the cabbage is just tender and still that lovely cheerful bright green.